Our vacation packages in Switzerland begin with an arrival in Zermatt by train 2nd class from the Swiss border or airport. Enjoy Zermatt, the famous car-free Alpine resort at the foot of the Matterhorn. Overnight in Zermatt. From Zermatt, the popular Gornergrat Bahn, Europe’s highest open-air cogwheel railway, takes you up to the Gornergrat. The train crosses impressive bridges, galleries and tunnels. On the Gornergrat viewing platform you are surrounded by 29 peaks rising to above 4000 m. Overnight in Zermatt. Day at leisure in St. Moritz. Chic, elegant and exclusive with a cosmopolitan ambiance, it is located at 1'856 metres above sea level in the middle of the Upper Engadin lake landscape. The dry, sparkling «champagne climate» is legendary and the celebrated St. Moritz sun shines for an average of 322 days a year. Overnight in St. Moritz. The vacation packages in Switzerland ends with a return to Swiss border or airport or continue your vacation in Switzerland at your own request. 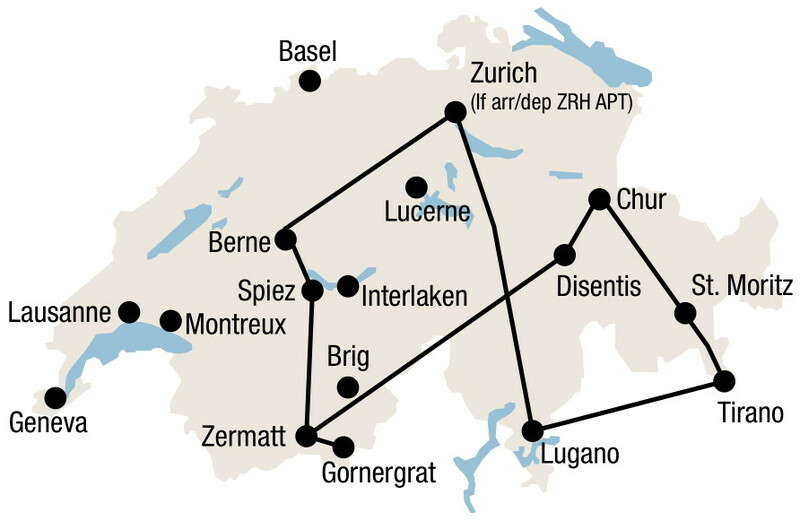 Swiss Transfer Ticket Combi: Swiss Panoramic Trains (4 transfers) in 2nd class from/to Swiss border or airport. Seat reservation for Glacier Express, Bernina Express (coach and train). 2 nights each in Zermatt + St. Moritz, standard room with private facilities, breakfast.